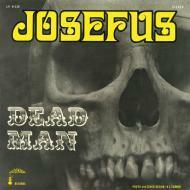 Dead Man is a 13th Floor Elevator descent headlong into southern-fried bloody Sabbath. Released on the Hookah imprint in 1970, the LP’s gaping cranium cover, sludged-up blues, and bone-bleached riffs outsold Let It Be, if only locally, being far “too psychedelic” and skull-crushing for Houston’s International Artists label to touch. A Texas-bound band except in tracking Dead Man inside the furnace of Phoenix, Josefus strode loud and longhaired amid the oil fields, peddling their own brand of black gold.